View our wide range of innovative concrete pouring solutions. Skips are manufactured to suit cranes and forklifts. Crane skips can be supplied with a choice of lifting points or bale arms. Choose from a range of automatic tipping skips from 500 litres to 12,000 litres. The design allows unassisted operation of the skip through a full cycle of loading and unloading. Safely handle construction material including bricks, blocks, mortar, kerb stones, gas bottles and more with our wide range of lifting equipment. The range also includes access platforms, mortar tubs and snow ploughs. View our range of site safety equipment including ladder guards and edge protection. Please call for any specialist site safety equipment requests. Man riding cages designed to carry between 1 and 4 persons. Including an Emergency Rescue Evacuation Cage capable of carrying a stretcher accompanied by 1 or 2 persons. The company has committed to the 2018 RWM show that runs from 12-13 September at the NEC. The show runs annually for the Waste Industry and visitors will be able to view products from our tipping skip range and to pick-up special show offers. Visit us on stand 5Q05. Whitney Engineering displayed a range of lifting gear at the 2018 Vertikal Days show at Donnington Park. The show was a great opportunity to meet new and existing customers and showcase the wide range of lifting gear that we offer. To top it all, the sun was shining! In its 25th year, the company has relocated from Stafford to Redditch as part of a new investment in the business by the Ladybird Crane Group. The new yard is part of a purpose built facility on the site of a former prison. The extra space will allow the company to holder a larger stock of new equipment and better facilities for maintenance and refurbishment of customers’ own plant. 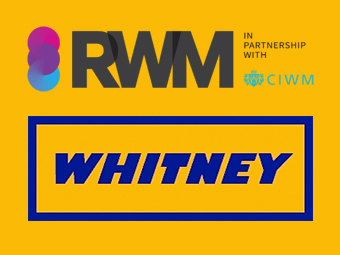 Whitney have now introduced the WSP Snow Plough attachment to convert your forklift into a snow clearing machine and keep your site of depot working even during heavy snow falls. The WSP comes in a range of four blade widths from 1250mm to 2130mm. Introducing the Whitney Teletub telehandler skip. The Whitney Teletub is the ideal tool to help maintain a clean and efficient building site. The driver always remains within the safety of the cab as it automatically locks/unlocks from behind fork heels. Click here for more details. Whitney Engineering is the UK distributor for the Secatol range of concrete and material handling equipment. The company also specialises in the design and supply of a range of forklift skips and handling equipment for the UK market.